You are welcome to make Comments on existing pages on the website, and to Contribute new pages. To do either, you must be registered with the website and log in. Click on the user symbol at the top of the page and select Login or Register. Log in by entering your email address and password. If you have registered for the website through Facebook or Google, the icons below password can be used instead. Should you forget your password, it can be reset through by selecting Lost Password. If you were registered with the New Forest Remembers website whose data is included in the New Forest Knowledge, you can log in without reregistering. Enter the email address you used for New Forest Remembers and click Lost Password. This will reactivate your account and link you to any articles you previously contributed to New Forest Remembers. Each time you log in, Your Profile page will be shown, in case you want to make any changes. To remove this page, click on any menu selection at the top of the page. To register, enter your email address, first and last name. A registration confirmation will be sent to your email address. Click on the link in the email and you will be asked to set a password, login and complete a Your Profile page with a little more information about yourself. If you wish to connect with your social media account, click on the Facebook or Google logo to make the link. This is only possible if the email used for your social media account is the same as that you registered with New Forest Knowledge. Once registered and logged in, you may suggest corrections to an item or add additional information by adding comments. Click on Comments on the Item Page and type the comment into the box that appears. Comments are reviewed by New Forest Knowledge staff and published on the website if appropriate. Contributions are articles added by registered users. They may contain information relevant to the New Forest’s history, people, places, wildlife and environment. Contributions are treated just like any other items in New Forest Knowledge, and are retrieved by searches in the same way. To see examples of Contributions, select Sources from the main menu and click Contributions. Before being published on the New Forest Knowledge website, Contributions are reviewed by a member of New Forest Knowledge staff. If there are any queries about your Contribution, you will receive an email from the staff member. Once you have posted a number of contributions successfully, a staff member can edit your user permissions to enable your contributions to be published immediately without review. Click the Contribute button on any New Forest Knowledge page and the Add Contribution page will appear. The page lists contributions you previously added, each of which you can edit by selecting its title. For a new contribution, enter Title and Description to identify the contribution. Text and Visual tabs on the Description box allow you to edit the Description. Tags can be selected to identify the Place, Period, Person and Group. Make a Group selection if you are making the contribution on behalf of a Group. You must be a member of the Group and have permission of the Group to make the selection. 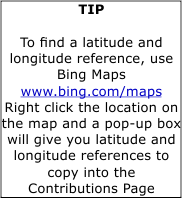 Adding Latitude and Longitude references allows your contribution to be shown on a Map. Permission boxes acknowledge the copyright of the material and the creative commons license used by New Forest Knowledge. Having submitted a contribution, the Contributions page tells you that it is pending review, prior to being published on the website.